Our society is sleep deprived. On average, Americans are sleeping one hour less per night than they did 20 to 30 years ago. The National Sleep Foundation estimates that the average American gets six hours and 40 minutes of sleep on week nights. The fast-paced American lifestyle and long work days are contributors; in one survey, the National Sleep Foundation found that Americans are spending 9.5 hours on the job, and over 17 hours out of bed. This lack of sleep is taking a toll on our health, and our weight. There is a growing body of research showing that a lack of sleep increases your risk of weight gain. One way it does this is by disturbing your body’s natural ability to regulate appetite. A recent study published in the American Journal of Clinical Nutrition attests to this. In this study, men participated in 2 conditions. In one condition, they got 8 hours of sleep. In the other condition, they got 4 hours of sleep. The next day, the men ate as much as they wanted. Food intake and physical activity were measured, as well as sensation of sleepiness. When the men only got 4 hours of sleep, they ate 559 more calories than when they got 8 hours of sleep! Their hunger levels before breakfast and before dinner were also greater. The results for physical activity were interesting. When the men were sleep restricted, they had higher physical activity levels in the afternoon than when they weren’t restricted. However, the night after sleep restriction, their activity levels were lower than when they got sufficient sleep. 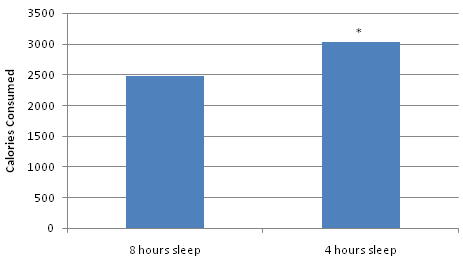 So there didn’t appear to be any major differences in overall physical activity between the sleep conditions. You can see the men were in energy balance when they got 8 hours of sleep; when the men were sleep deprived, they were in a positive energy balance of 444 calories per day. If this sleep deprivation was kept up for an entire year, it would result in over 40 pounds of weight gain! While the sleep deprivation in this study is more than what most people experience, it is still clear that not getting enough sleep can be a problem. This study is Just one of a growing number of studies showing how a lack of sleep can wreak havoc with your appetite. You should be getting 7 to 8.5 hours of sleep per night. Getting enough sleep is critical if you want to lose weight and keep it off. In this case, if you snooze, you will definitely lose….weight. Congrats on the new site. I will be following closely. My subjective assessment concerning food intake on days which I receive less than adequate sleep mimics the findings above. Interesting stuff, I’ll be circulating this post for certain. Thanks for the compliment and I’m glad you like the site. There is a lot of data out there showing how sleep restriction can disrupt the hormones that regulate appetite. I thought this study did a good job of quantifying how much your appetite can be affected. I think this is an often overlooked aspect of weight maintenance. We’ll have to meet up some time since I know you live in the Seattle area; I currently live in Redmond. I’ve been seeing observational studies on this for some time and my own conclusion was there was a third factor decreasing sleep and increasing weight. Haha, Sam! Nope, no Ambien funding for this one. There’s actually a lot of research coming out showing how sleep loss directly disturbs the hormones that regulate appetite. Whilst anecdotes don’t constitute evidence, I made this connection myself a few years ago so it’s interesting that a lot of research is coming out now to support the idea. I realised that on days when I’m particularly behind on sleep and feeling tired, I also invariably have a constant, insatiable appetite, predominantly for carbohydrate-rich foods. Coupled with a lack of energy/motivation for exercise, these periods of sleep loss inevitably lead to weight gain. The research definitely supports your personal experience. There was one study published a few years ago that showed that people developed a craving for carbohydrate-rich foods when sleep-deprived. What I find interesting is that it doesn’t manifest itself as an actual physical hunger i.e.stomach pain, rather it’s more of a psychological urge to keep wanting more food, perhaps similar to the ‘out of control’ feelings that binge eaters are reported to have. It’s as if my brain thinks that carbohydrates will wake me up, though of course they tend to have the opposite effect! James, I will be starting a job that will almost certainly require me to sleep less than 6 hours a day. Is there anything I can do to counter the need for extra food? That’s tough to say, Jeremy. I would say it will simply require extra diligence. Making sure you make up for the lack of sleep by doing all of the other things that help improve satiety, like a high protein intake and sticking with mainly whole, unprocessed foods. I think this resonates very much with the experience I have myself: On days where I don’t get enough sleep I find myself craving sugar (in addition to other things such as lack of mental clarity). Congratulations on the new website, I look forward to reading the articles you have made! It makes perfect sense but what the difficult part is trying to get that sleep. Sleep does not come easy for me. Would love to sleep eight hours. The link to the study isn’t working.